A careful history and directed examination are usually sufficient to diagnose and manage most patients presenting with tremor. Tremor is the most common movement disorder in adults.1 Most internists and all neurologists will encounter patients with tremor in their practice. Using a series of 3 questions focusing on history and phenomenology, we demonstrate a practical approach to patients with tremor in the outpatient setting. Tremor is a regular, hyperkinetic movement in which a body part oscillates to and fro around an axis. 1. Is the movement disorder actually tremor? 2. Is the tremor isolated, or are there accompanying neurologic abnormalities? 3. What are the phenomenologic features of the tremor? A meticulous history and examination are indispensable in answering these questions. Ask about the time course, acuity of onset, progression, and specific triggers of the tremor. Obtain a detailed history of drug exposure, current medications, and interventions that improve tremor (eg, alcohol ingestion). Document any family history of tremor or other neurologic complaints in parents, siblings, and children. Several hyperkinetic movement disorders can mimic tremor, including action myoclonus and dystonia of the upper limbs. Once these are ruled out, determine whether the tremor is isolated or accompanied by other neurologic abnormalities. Because parkinsonism is the most common syndrome accompanying tremor, assess for the presence or absence of facial masking, decreased blink rate, appendicular bradykinesia and cogwheeling, shortening of stride length, stooped posture, and impairment in postural reflexes. Tremor also often accompanies cerebellar dysfunction, in which case patients may also have nystagmus, impaired ocular pursuits, dysmetria, overshoot, truncal ataxia, and a wide-based gait. Tremor may accompany dystonia and is usually irregular with a null point, a position in which dystonic movements and tremor may abate. In these patients, look for sustained dystonic postures, task-specific dystonic movements, and improvement with sensory tricks (geste antagoniste maneuvers). Whether the tremor appears in isolation or not, accurate diagnosis depends on characterization of phenomenology. Triggers of tremor at rest, with posture, with action, and with specific tasks are important.2 Define and document the frequency and amplitude of tremor, especially if these vary during the examination. While tremor is defined as a regular oscillatory movement, some patients present with movements that are tremulous in appearance but irregular. Although a point of controversy, it is probably best to include these patients in the tremor rubric, characterizing their tremor as irregular in frequency. Figure 1. Archimedes spiral performed by a patient with essential tremor. Note the axis of maximal amplitude of tremor at 60°. A common mistake in examining patients with tremor is to rush the examination. Remember that some forms of tremor take 30 seconds or more to emerge—patience is a virtue! Examine all patients in the true rest position, with hands pronated and resting on their lap. Ask the patient to reposition her or his hands with pinkies down and thumbs up, as both parkinsonian and Holmes tremors are often triggered by this posture. Ask patients to raise their arms forward in an outstretched position, holding it for at least 10 seconds. Follow this with a request for the patient to hold his or her arms outstretched to the sides—in the wing-beating position—for at least 10 seconds as well. Without holding of these 2 postures, any postural-reemergent tremor will be missed, as will the rare postural crescendo tremor of Wilson’s disease. Next, assess the patient’s ability to repeatedly bring the finger of an outstretched arm and hand to her or his own nose repeatedly and bilaterally, understanding that patients with action (kinetic) tremor will hurry through this maneuver in order to improve accuracy. Ask the patient to write in both script and print and to draw the Archimedes spiral with each hand while ensuring that the patient keeps his or her writing arm off the table and extends the spiral to the edge of the page (Figure 1).2 Observe the patient walking to see if gait triggers his or her tremor. In patients with specific tremor disorders, observing maneuvers that trigger tremor can be particularly useful. Ask patients suspected to have essential tremor (ET) to draw a straight line connecting 2 dots, pour water between cups with each hand, drink from a cup, and use a soup spoon to drink liquid. Task-specific or position-specific tremors may be triggered by specific activities such as writing, playing a musical instrument, or holding an object such as a racquet or golf club. Other forms of tremor (eg, orthostatic tremor) are specifically triggered by standing, and tremor typically resolves when the patient touches a wall or walks. Figure 2. Frequencies of the major forms of tremor. Amplitude appears on the y axis, and frequency (typical frequency) and range of frequencies seen appear on the x axis. Having defined the phenomenology, the next task is to determine whether or not the patient’s tremor fits into one of the major tremor syndromes. 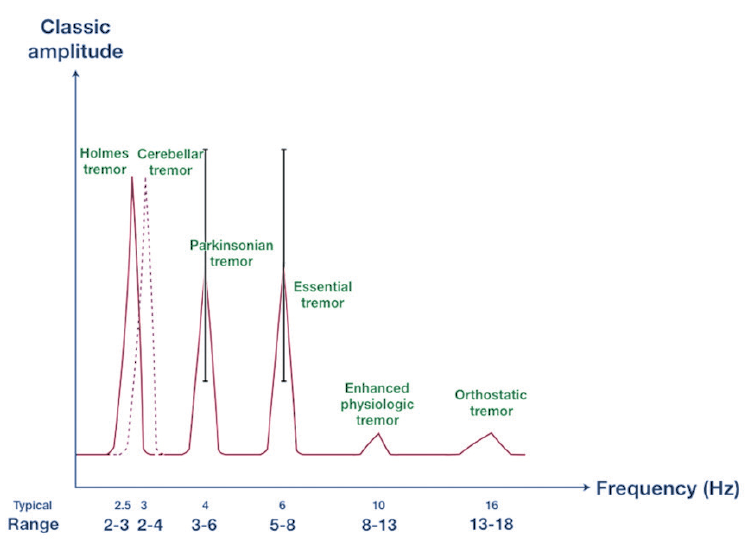 Figure 2 illustrates the dominant frequencies of the major tremor syndromes. Although Holmes tremor, parkinsonian tremors, and cerebellar tremors all have a similar frequency of 3 Hz, Holmes and parkinsonian tremors are usually present at rest, whereas cerebellar tremors are usually present with posture and action. Holmes tremor is often present both at rest and with action. The classic postural and action tremor of ET has a frequency of 6 Hz that often slows to 4 Hz with advancing age. Enhanced physiologic tremor is typically 8 Hz to 10 Hz, which is typically too fast to count when observed in a patient’s outstretched hands. Orthostatic tremor is the fastest tremor, typically 14 Hz to 16 Hz; orthostatic tremor can be palpated as a quivering sensation in the legs when the patient stands. The 10 major tremor syndromes are listed in the Table, and the phenomenologic features of each disorder are briefly summarized here. ET is the most common cause of an isolated tremor disorder. It classically affects the hands and may also affect the voice or the head. The tremor is usually symmetric and almost always more noticeable with action than with posture or rest. Patients who drink alcohol usually notice improvement in their tremor. Patients with ET often employ strategies to mitigate their tremor, such as using 2 hands to hold a cup or bracing their elbow on a desk to write. 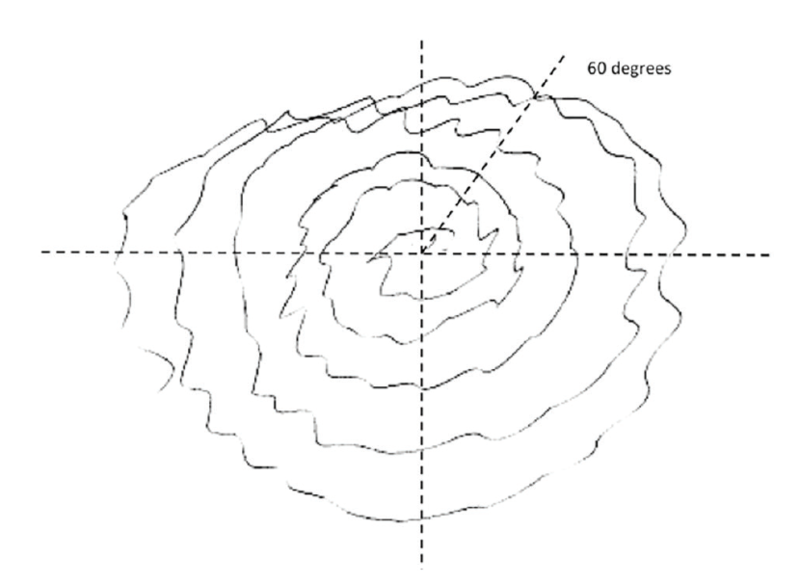 Figure 1 illustrates the classic Archimedes spiral of ET—note the maximal tremor amplitude at an axis of 60° characteristic of the disorder. Approximately half of patients with ET have a family history consistent with autosomal dominant inheritance, although phenotypic variability and age at onset can vary widely. Patients with ET who have a long history of tremor may have mild cerebellar signs; for example, difficulty performing tandem gait. The typical parkinsonian tremor of Parkinson’s disease (PD) is always unilateral in onset, affecting the hand (or occasionally the leg) at rest.3,4 In PD tremor, the distal hand and fingers (typically thumb and index) are commonly affected (in contrast to ET, which affects the more proximal arm). The resting tremor of PD typically disappears if the hand is repositioned, only to return 10 to 15 seconds later if the new resting posture is maintained. PD tremor classically disappears with action, in contrast to ET, in which action triggers tremor. Some patients fall into an overlap syndrome between PD and ET; these patients typically present with a history of ET for many years, and then develop a rest tremor with mild parkinsonian signs.5,6 The presence of postural and kinetic tremor out of proportion to that expected in PD should raise the suspicion of a PD/ET syndrome. Enhanced physiologic tremor is another common reason for referral to the office.7 This fine fast tremor is absent at rest, always symmetric, and specifically triggered by holding the arms outstretched in front, rather than with action. Patients with enhanced physiologic tremor may notice that stress, sleep deprivation, and excess caffeine intake exacerbates their tremor, and alcohol does not ameliorate it. Cerebellar tremor may accompany disorders that affect the cerebellar neurons (eg, spinocerebellar ataxias, olivopontocerebellar degeneration) or the afferent or efferent connections of the cerebellum (eg, multiple sclerosis, brainstem strokes). The classic cerebellar tremor is coarse, slow (3 Hz), affecting proximal muscles (ie, wing-beating tremor), and usually accompanied by cerebellar signs such as dysmetria, titubation, and dysdiadochokinesis. Functional, or psychogenic, tremor may mimic organic tremor syndromes. Differentiating the two usually requires experience (Box 1).7-9 A history of abrupt-onset tremor, a waxing and waning course, periods of remission, movement of tremor from one body area to another, and the presence of other movement disorders (eg, posturing, jerking movements) suggest a functional etiology. Supporting features on examination include an equal severity of tremor at rest, with posture, and with action; variability in tremor frequency and axis; unusual triggers; unusual body distribution (for example, tremor affecting one arm and the opposite leg); entrainment of tremor to voluntary movement; and accompanying inconsistent features on the neurologic examination (eg, give-way weakness, inconsistent slowness). 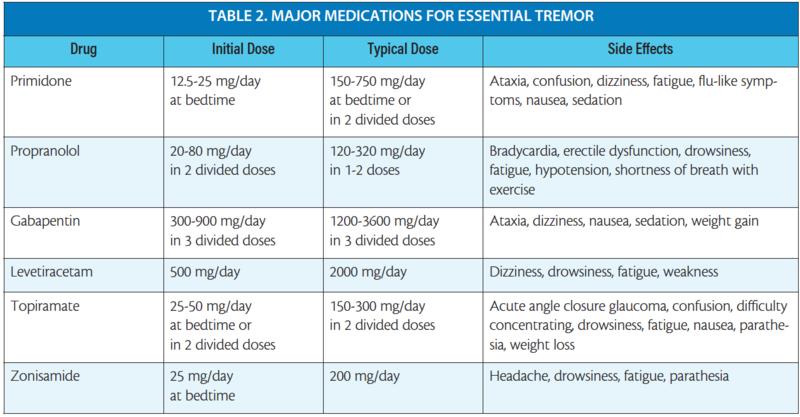 Drug-induced tremors are also not uncommon and may cause rest or action tremor dependent on the drug.10 Box 2 lists common medications that may cause tremor. Lithium and valproic acid are among the more common offenders. These agents are used for mood stabilization, and both drugs can produce a tremor that is indistinguishable from ET. Both also exacerbate action tremor in patients with underlying ET. Amiodarone, β-adrenergic agonists, cyclosporine, terbutaline, and theophylline may also trigger a postural and action tremor. Both typical and atypical neuroleptics and antiemetics (eg, promethazine, prochlorperazine) can cause tremor, typically as part of a syndrome of drug-induced parkinsonism. Symptoms of drug-induced parkinsonism including rest tremor can be asymmetric, and signs may take 6 to 8 weeks to resolve after discontinuation of the offending agent. The occurrence of parkinsonism with dopamine receptor blockade may also herald the development of PD in older patients. Dystonic tremor is a somewhat controversial entity, in which patients with dystonia (a hyperkinetic movement disorder typically producing slow, sustained, twisting postures) may also have tremor in the same part of the body affected by dystonia.11 Dystonic tremor frequently affects the neck (in patients with cervical dystonia) or the arm (in patients with limb dystonia). The frequency and amplitude of dystonic tremor is often variable, typically irregular, and may disappear when the affected body part assumes a dystonic position (the “null point”). Holmes tremor is rare and typically occurs in a delayed fashion after a structural lesion has affected the cerebellar thalamus, dentate nucleus, or middle cerebellar peduncle.12 The typical Holmes tremor is slow, 2 Hz to 3 Hz, coarse, present at rest and also with action, and often accompanied by cerebellar deficits. Orthostatic tremor is an unusual tremor that affects the trunk and legs and is specifically triggered by standing.13 Patients typically complain of difficulty standing or walking and may be unaware of their tremor. Touching the hand of the examiner or a wall stops the tremor, and tremor also usually abates when patients walk. Task-specific tremor is specifically triggered by a task, such as writing, bowing a musical instrument, or using scissors. Whether these unusual tremors are forms of ET or task-specific dystonia is a point of controversy. Some patients with tremor presenting to the office have tremors that are unusual or difficult to classify. Patients with ET may present in several ways that can confuse the inexperienced examiner. Patients may present with an isolated tremor of the voice, with no head tremor or action tremor of the hands. Patients with isolated vocal tremor are overwhelmingly women, usually over age 60, and almost always report improvement in their tremor if they drink alcohol.14 Some patients with ET have very asymmetric presentation, with an action tremor affecting only one arm. More challenging, others present with an isolated tremor at rest that mimics a parkinsonian rest tremor but without bradykinesia or cogwheeling. These patients may be misdiagnosed with PD, although dopaminergic imaging studies are usually negative. A summary of disorders with prominent rest tremor versus those with prominent postural/action tremor appears in Table 1. Although the majority of patients referred for the evaluation of tremor do not require extensive ancillary testing, 3 caveats apply. In young patients presenting with tremor or any new movement disorder, excluding Wilson’s disease is of paramount importance.15,16 The tremor of Wilson’s disease can take any form, and signs of parkinsonism, dystonia, or cerebellar dysfunction can be subtle early in the disease course. Careful examination of the iris by side illumination in the office can reveal Kayser-Fleischer rings. A serum ceruloplasmin, slit-lamp examination by an experienced ophthalmologist, 24-hour urine copper collection, and noncontrast MRI are sufficient to rule out this reversible and treatable disorder. Patients with hyperthyroidism may present with an action tremor. Checking for normal levels of thyroid-stimulating hormone and free thyroxine will rule this out. A full discussion of treatment options for tremor is beyond the scope of this article. We confine brief comments to the management of Holmes’ tremor and ET. Patients with Holmes’ tremor have been treated with levodopa; however, this has been effective in only 50% of patients treated. Although sometimes daunting, the patient with tremor offers the clinician the opportunity to demonstrate clinical expertise. Focusing on basic phenomenology, most patients can be diagnosed without ancillary testing, and treatment can be initiated quickly. 1. Mailankody P, Netravathi M, Pal PK. Review of tremor in Parkinson’s disease and atypical parkinsonian disorders. Neurol India. 2017;65:1083-1090. 2. Alty J, Cosgrove J, Thorpe D, Kempster P. How to use pen and paper tasks to aid tremor diagnosis in the clinic. Pract Neurol. 2017;17:456-463. 3. Chen W, Hopfner F, Becktepe JS, Deuschl G. Rest tremor revisited: Parkinson’s disease and other disorder. Transl Neurodegener. 2017;6:16. 4. Ayturk Z, Yilmaz R, Akbostanci MC. Re-emergent tremor in Parkinson’s disease: clinical and accelerometric properties. J Clin Neurosci. 2017;37:31-33. 5. Marsala SZ, Pistacchi M, Gioulis M, Ferracci F, Capus L. Clinical and imaging study of isolated and mixed rest and action tremor: essential tremor versus Parkinson’s disease. Ann Indian Acad Neurol. 2017;20:138-141. 6. Fekete R, Jankovic J. Revisiting the relationship between essential tremor and Parkinson’s disease. Mov Disord. 2011;26:391-398. 7. Logigian EL, Wierzbicka MM, Bruyninckx F, et al. Motor unit synchronization in physiologic, enhanced physiologic and voluntary tremor in man. Ann Neurol. 1988;23:242-250. 8. Schwingenschuh P, Deuschl G. Functional tremor. Handb Clin Neurol. 2016;139:229-233. 9. Thenganatt MA, Jankovic J. Psychogenic tremor: a video guide to its distinguishing features. Tremor Other Hyperkinet. 2014;4:253. 10. Morgan CJ, Kurek JA, Davis JL, Sethi KD. Insights into pathophysiology from medication-induced tremor. Tremor Other Hyperkinetic Mov. 2017;7:442. 11. Defazio G, Conte A, Gigante AF, Fabbrini G, Berardelli A. Is tremor in dystonia a phenotypic feature of dystonia? Neurology. 2015;84:1053-1059. 12. Raina GB, Cersosimo MG, Folgar SS, et al. Holmes tremor: clinical description, lesion localization and treatment in a series of 29 cases. Neurology. 2016;86:931-938. 13. Benito-Leon J, Domingo-Santos A. Orthostatic tremor: an update on a rare entity. Tremor Other Hyperkinet Mov. 2016;6:411. 14. Patel A, Frucht SJ. Isolated vocal tremor as a focal phenotype of essential tremor: a retrospective case review. J Clin Mov Disord. 2015;2:4. 15. Jang W, Cho J, Kim JS, Kim HT. Wilson’s disease only presenting with isolated unilateral resting tremor. Can J Neurol Sci. 2011;38:939-940. 16. Soltanzadeh A, Soltanzadeh P, Nafissi S, et al. Wilson’s disease: a great masquerader. Eur Neurol. 2007;57:80-85. 17. Raina GB, Cersosimo MG, Folgar SS, et al. Holmes tremor: Clinical description, lesion localization, and treatment in a series of 29 cases. Neurology.2016;86(10):931-938. 18. Alqwaifly M. Treatment responsive Holmes tremor: case report and literature review. Int J Health Sci. 2016;10(4):558-562. 19. Witjas T, Carron R, Boutin E, et al. Essential tremor: update of therapeutic strategies (medical treatment and gamma knife thalamotomy). Rev Neurol(Paris). 2016;172:408-415. This sleep disorder is a strong predictor for the development of synucleinopathies, including Parkinson’s disease, multiple system atrophy, and dementia with Lewy bodies. Sleep problems are common and treatable in neurodegenerative disorders, and may also be a treatable risk factor and early biomarker. Given limited treatments available, investigating potential benefits of cannabinoids can offer cautious optimism over controversy. There is growing evidence that high-intensity exercise is neuroprotective. Carcinoma of the tongue is a rare secondary cause. It is important to consider comorbid sleep disorders for patients with epilepsy. 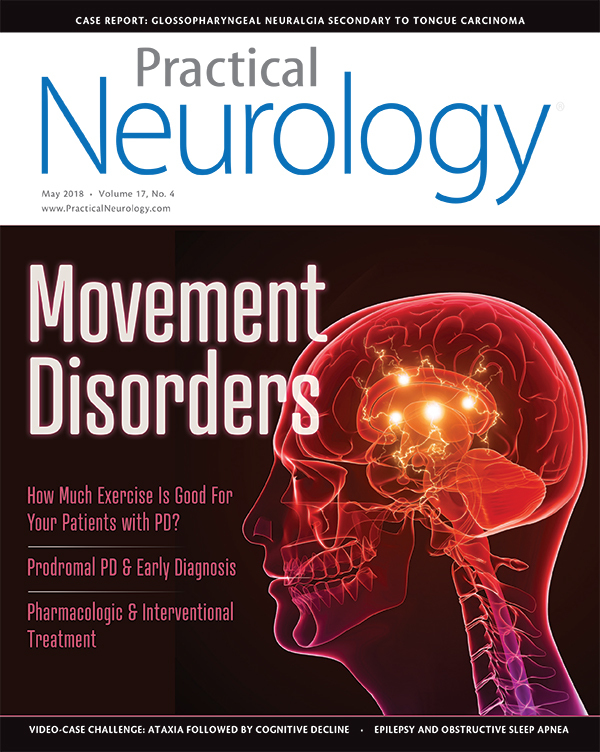 Launched in 2002, Practical Neurology is a publication uniquely dedicated to presenting current approaches to patient management, synthesis of emerging research and data, and analysis of industry news with a goal to facilitate practical application and improved clinical practice for all neurologists. Our straightforward articles give neurologists tools they can immediately put into practice.